NSX provides a platform for best-of-breed solutions from ecosystem partners to help customers optimize their Software Defined Data Center deployments. The “VMware Ready for Networking and Security NSX Partner Program” enables, provides support and certification for partners’ integration with NSX. Services from VMware technology partners are integrated with the NSX platform in the management, control and data planes. The result is a unified user experience and seamless integration with any cloud management platform, with the possibility for roles and duties separation. 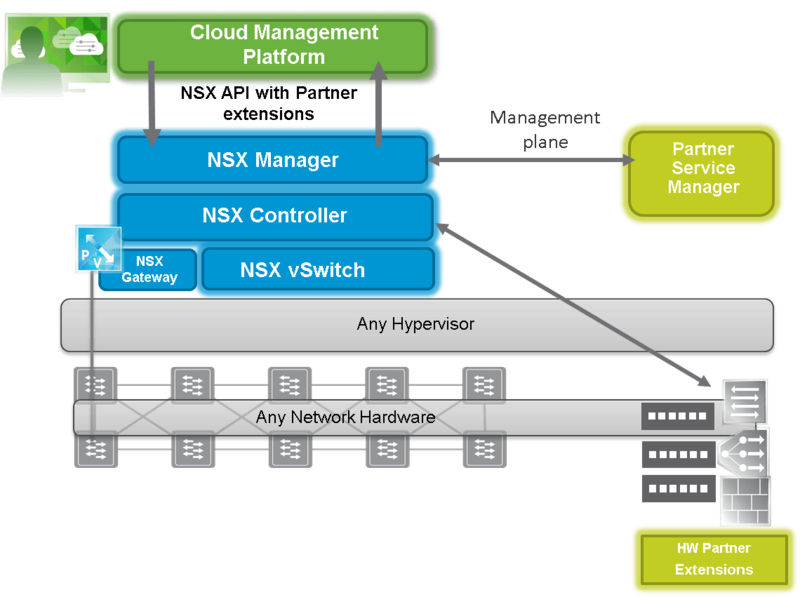 VMware technology partners can leverage the distributed service framework of NSX. The service insertion platform allows service composition at multiple points in the virtual network and cloud. The NSX platform can be extended to enable partners services workflows to automate of provisioning, insertion, consumption and operations in the Software Defined Data Center. Partner services can leverage the NSX distributed service framework and service insertion platform that allows service composition at multiple points in the virtual network and Cloud. Services from ecosystem partners are integrated with the NSX platform in the management, control and data planes for a unified user experience and seamless integration with any Cloud Management Platform, while allowing for roles and duties separation. Replace – customer can replace an NSX component with a partner component. Complement – Partners provide new services and components that NSX does not include. Program access includes the tools and resources needed during development and release. Partner solutions that pass the certification will be listed in VMware Comparability Guide (VCG) and can apply for the “VMware Ready for Networking and Security” Logo. Pre Partner GA – Development and Engineering Support: Partners report issues on DCPN, technical Support, design review at checkpoints. Membership in this program when renewed, entitles partners to vSphere and NSX update releases as well as development and certification kit refreshes for the duration of their participation in the program. Additionally, the program may allow for access to early versions of vSphere or NSX for the purpose of developing and testing. A partner engineering manager and/or technical lead that is the primary point of contact for the partner’s engineering team, reviews all VMware support requests submitted by the partner’s engineering team, provides an interface to the partner’s QE organization, and attends all status calls and live debugging sessions with VMware. A partner technical support contact that manages the support relationship with VMware, owns and serves as a single point of contact for all support-related activities, including escalations and management of the TSANet membership, and ensures overall support readiness and training of the partner’s support organization.